Seattle remains on the lookout to add to its receiving corps. 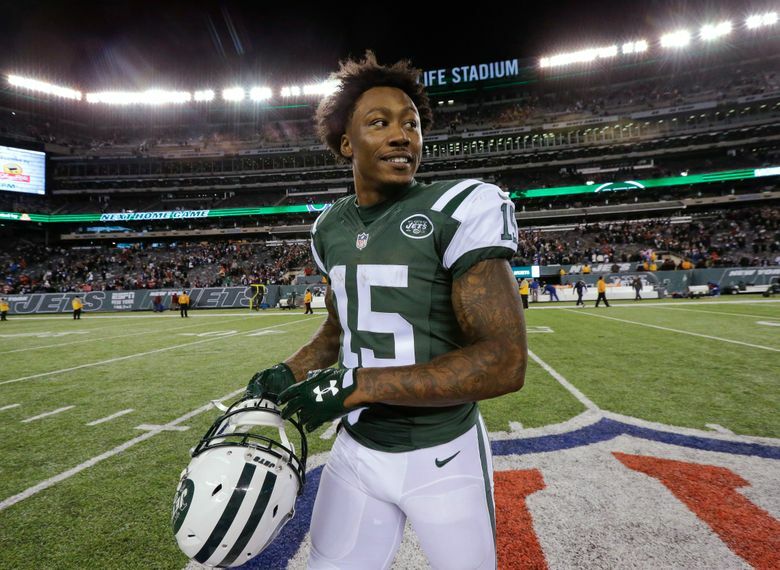 The Seahawks brought in veteran receiver Brandon Marshall for a visit Wednesday, a source confirmed to the Times, as the team continues to look to add to its receiving corps. The news was first reported by ESPN. But as of early Wednesday evening it was unclear if a signing was imminent. The 34-year-old was released by the Giants last month when he reportedly refused to take a paycut. He signed a two-year, $12 million deal with the Giants prior to the 2017 season but played just five games last season due to an ankle injury and caught just 18 passes for 154 yards and no touchdowns, all totals the lowest of an NFL career that dates to 2006 — Marshall was already out for the year when Seattle beat the Giants 24-7 in New York last October. Marshall was released with a failed physical designation and a key component of his visit to Seattle was to assess his health. His production had already begun to tail off even before his injury last season and the Seahawks would likely want to make a minimal investment in Marshall — surely a one-year deal at maybe not a lot more than the veteran minimum guaranteed and likely then packed with incentives. Seattle has 10 receivers on its roster but little proven depth behind what figures to be the top three of Doug Baldwin, Tyler Lockett and Jaron Brown. The 6-4, 229-pound Marshall would also be taller and heavier than any receiver on the roster other than Tanner McEvoy, potentially giving the Seahawks the kind of bigger target the team is always on the search to get more of, and specifically the kind of red zone threat Seattle needs to replace what it got last year from tight end Jimmy Graham, who signed with Green Bay. And while Marshall’s age and injury history mean Seattle won’t expect to get the Marshall of his prime, his history can’t be discounted — he has eight 1,000-yard seasons and has been named to the Pro Bowl six times, doing both most recently in 2015 when he had 109 receptions for 1,502 yards and an NFL-high 14 touchdowns. But he also has just 77 receptions for 942 yards and three touchdowns in 20 games since then and Seattle would likely be banking on getting more of a complementary and situational role from Marshall. One of the biggest takeaways from Marshall’s visit is that it appears to add further validity to the claims of general manager John Schneider and coach Pete Carroll that the Seahawks are not in full rebuild mode. While Seattle has shed a number of veterans this season, the Seahawks have also signed the likes of 33-year-old defensive tackle Tom Johnson and 30-year-old tight end Ed Dickson to fill holes created by other free agent departures. Marshall could likewise help fill a vacancy created when Paul Richardson left for Washington, signing a five-year, $40 million deal as well as Graham. This is the second time in the Carroll era Seattle has courted Marshall. Seattle also brought him in for a visit in 2010 when he was a restricted free agent. Marshall ultimately signed a tender with the Broncos and then was traded to Miami. Marshall is represented by MSWorld, whose clients also include current Seahawks Duane Brown and Marcus Smith and former Seahawk Brandon Mebane, among others.